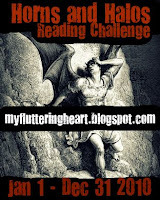 I've abandoned two of the books on my list for the Horns & Halos challenge - I'm all frustrated! They've been devil books though, so that's probably why - I'm going to try angels instead. im so glad you're enjoying your books! You're rather angelic so far...lets see if I can't pull you down a bit by recommending some of the devil books I'll be reading! Jenny, I'm the exact opposite of you right now...my first review was on angels but there just wasn't enough 'angel stuff', I'm now halfway through Hush Hush and even though its not as bad as everyone told me it was going to be, I'm still craving more evil! I had to send another angel's book 'Vintner's Luck' back to the library, so I'm feeling like something a little more devilish in the next few books. I have a feeling I'm going to be slipping down from my current level (garden of eden)...to purgatory. Eep!